I've been wanting to build this project for a long while. We're not too fancy in our house. 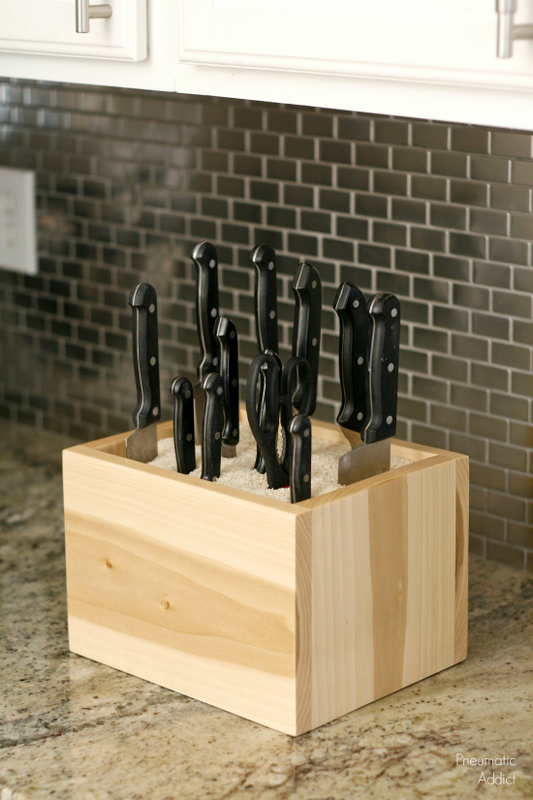 We don't have a full set of matching knives in a beautiful, custom knife block. We have a random assortment of hand-me-downs and Ikea specials. I'd seen knives stored in rice before and thought making a custom box would be the perfect solution. This is a perfect beginner project! 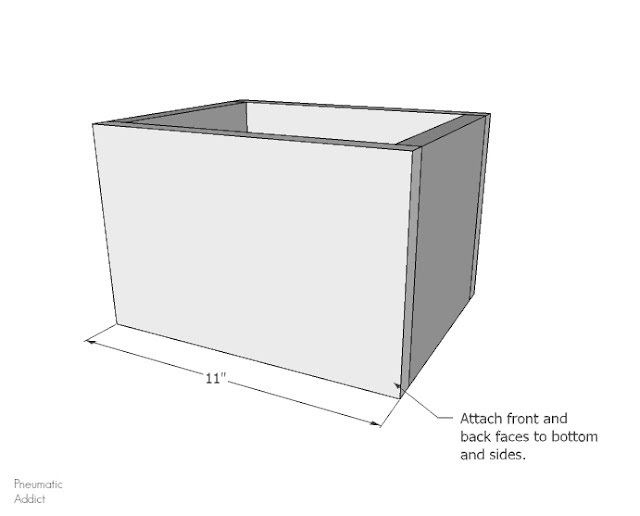 It can be made with just a few basic tools and is a great way to get acquainted with building. All the wood comes from a 4' long 1 x 8 board. I used poplar, which raised the price of materials slightly, but if you chose to make your rice block from pine, this project would cost less than $10 to make. 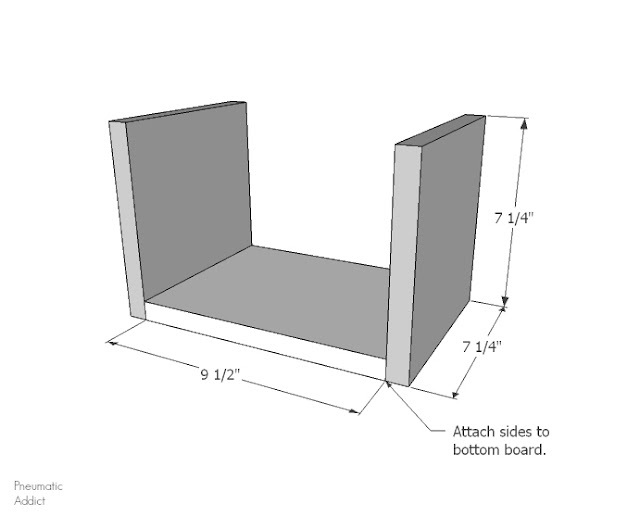 (1) 1 x 8 x 48"
(2) 1 x 8 @ 11"
(2) 1 x 8 @ 7-1/4"
(1) 1 x 8 @ 9-1/2"
1. The first step is to cut all pieces to length. Take the 7-1/4" x 9-1/2" bottom board and lay it flat on the work surface. 2. 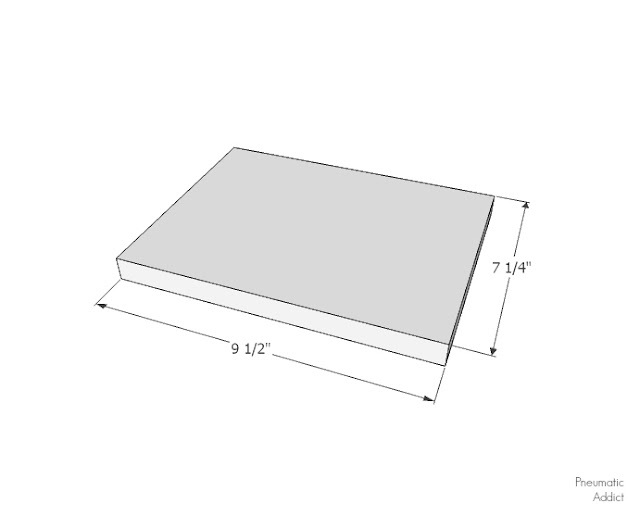 Align a 7-1/4" x 7-1/4" side boards on either end, vertically. Brush glue on both connected planes. 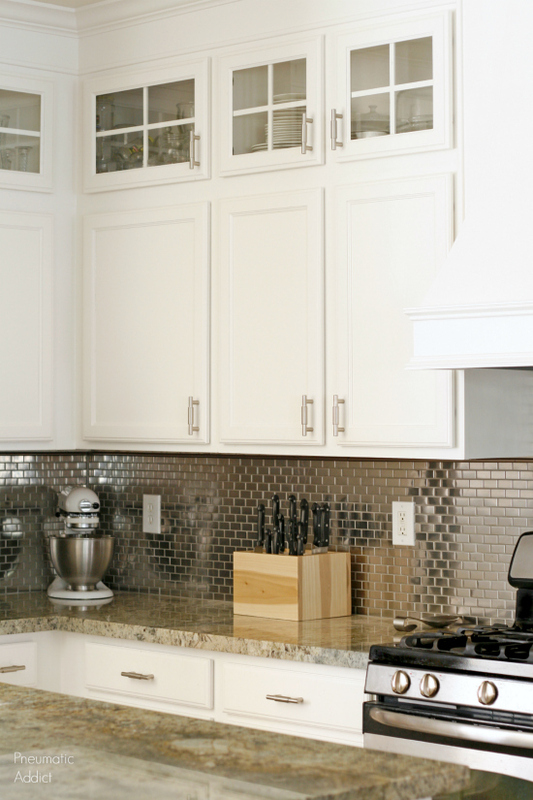 Use clamps or tape to hold the pieces together. If the tops of your side boards start to pull inward, place your piece of 9-1/2" scrap close to the top, between the boards. You can see the scrap board being used as a spacer, holding the sides in place. 3. Once the glue has dried for several hours, put the front and back face boards in position. Brush wood glue on all connecting planes. Clamp or tape pieces in place and allow to dry overnight. 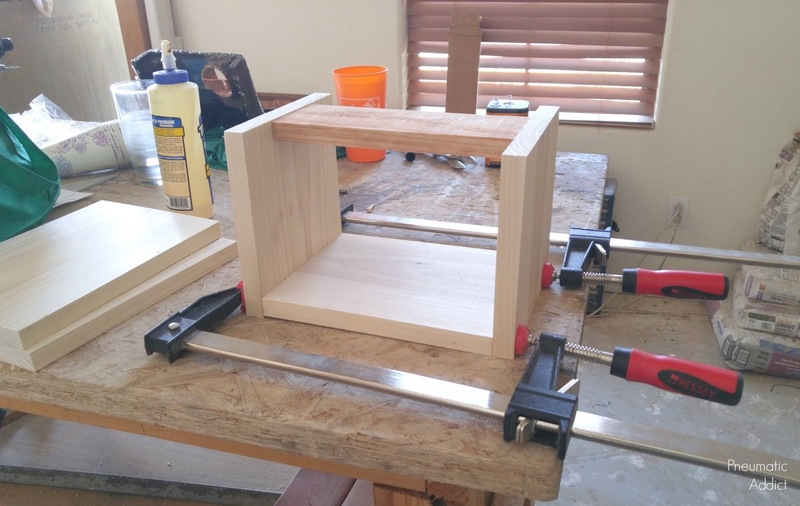 If you have at least four, 12" long bar clamps, you can attach all four sides to the bottom board at once, clamp in place, and only have one dry time. 4. 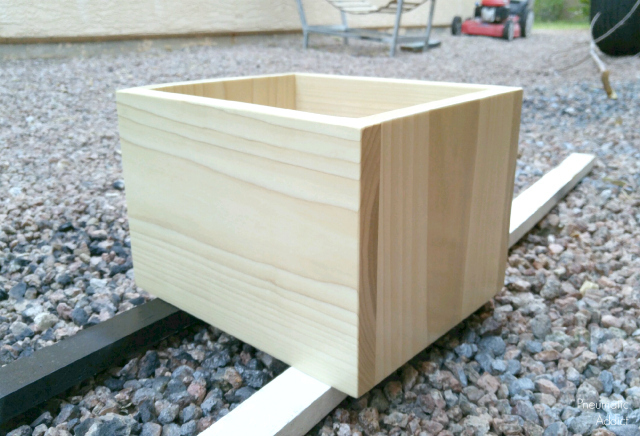 Once the glue is dried and the clamps have been removed, you can sand and finish the box however you like. I sanded mine progressively, up to a 400 grit, then finish with several coats of *Deft spray lacquer in a satin finish. I love this stuff! Its my go-to clear coat for most furniture projects. It what I used to seal my cabinets after I stained them darker without stripping the original finish. 5. After your finish is dry, the last step is to fill the box with rice. I used 10 lbs of long grain white rice, which cost around $5 at the grocery store. The rice not only holds onto any shaped utensil, it also absorbs any residual moisture left from washing. My cheapo knives frequently show small rust spots, so hopefully that will stop. I love my new knife storage! It was so easy to make and it holds all of my random cutlery. Truth be told, when I started build this project, I thought I would be staining the wood, but the grain on the poplar was so beautiful, I couldn't bring myself to cover it up. Surprisingly. I kinda dig the natural wood look in my white kitchen. 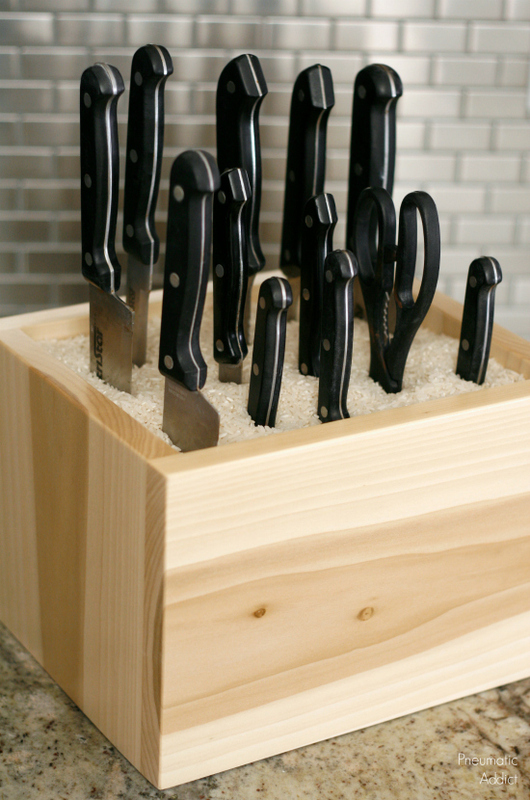 Ready to make your own custom rice knife block? Or pin the image below and save the idea for later. 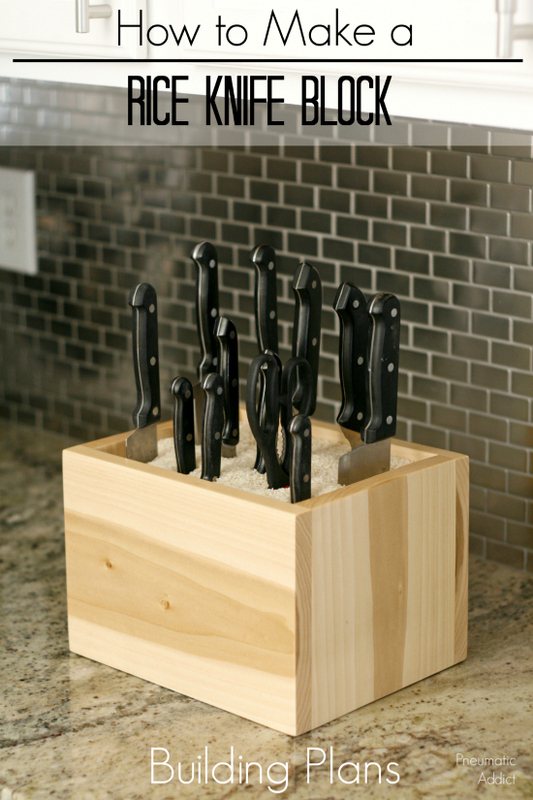 This is a gorgeous knife block! I'm trying to think of a substitute for the rice. Here in Florida, cockroaches eat everything so open rice is a open call for them. I just came across this via Pinterest and saw your comment. I don't know if you're still interested in this or if you've done it and figured out a solution. 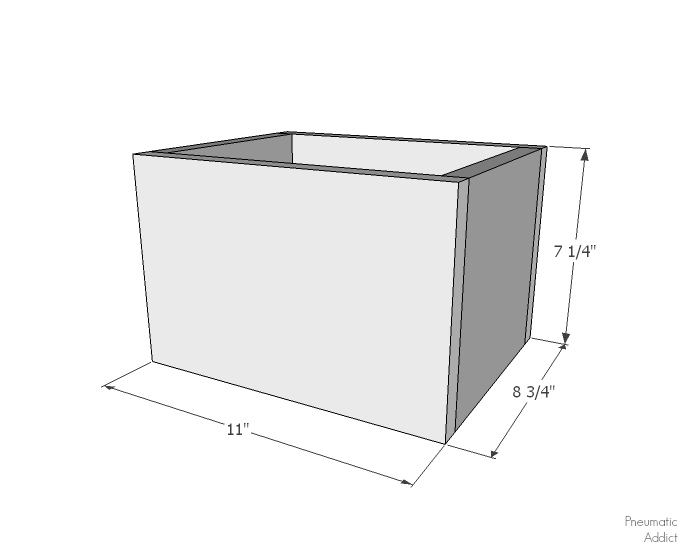 But if you are still interested and haven't figured out a solution, I see some on Pinterest that are filled with bamboo skewers, length cut to fit the box. It looks like they are usually point-up -- I guess the knives "slide" down them easier? It looks like perfect natural decor. Thank you fo such useful details. Great project! And you are right, that poplar wood is GORGEOUS!